You need to open plastic packaging, and you don’t want to go get the scissors. You could use your teeth, right? Stop! Don’t do it! Bad dental habits could create a dental emergency that you’d need to address with your Chevy Chase dentist. Maybe you’ve picked up some bad habits here and there when it comes to your teeth, but the good news is that you can replace them with good habits and protect your smile. After all, you have only one set of permanent teeth. Take good care of them by avoiding these common pitfalls to help prevent a dental emergency from happening to you. 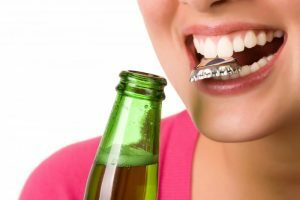 Your teeth are tools for eating and speaking, not for opening bottle caps or plastic packaging. Although natural teeth and modern tooth restorations are strong, they shouldn’t be used to perform tasks that other tools can do much better and more safely. You could chip a tooth or restoration or cause worse injury. Instead, play it safe and keep simple tools like scissors handy, so you can grab them for those tasks you need to do. Your diet not only affects your waistline; it also influences the health of your teeth and gums. When you eat or drink sugary substances, like soda, bread, or even cough drops, traces remain in your mouth. The bacteria that live there thrive on sugar and then produce acid that attacks your teeth and gums, leading to decay or gum disease. The more you eat these substances, the more risk you present to your oral health. Make some lifestyle changes and eat healthier foods, like carrots, which actually help keep your teeth clean. Drink more water and less sugary drinks. If you choose to drink sugary fluids, use a straw to bypass your teeth and minimize their exposure to sugar. Maybe it’s a nervous habit or maybe you do it when you’re bored. Well, when you chew on rock-hard ice, fingernails, or a pencil, you put undue pressure on your teeth. Your teeth can chip or crack and lead to pain or decay. Rather than chewing on ice, you could use a sugar-free gum—if you feel the urge to chew something. If you play a contact sport, like football, basketball, or hockey, don’t play without a mouthguard. Accidents happen, and your teeth could chip, get knocked out of place, or even fall out completely. That little piece of plastic can protect your upper teeth; it’s an easy way to make sure your teeth don’t get damaged while you play. You can buy self-fitting mouthguards from a store, or your dentist can make you a custom one. You may think they look cool, but tongue or lip rings can chip or crack a tooth if you bite down on the metal stud. Also, when the metal rubs against your gums, it can cause gum damage and eventually tooth loss. The bacteria in your mouth can congregate around your piercing, raising your risk of infection and sores. The easiest way to avoid this situation is to not get a tongue or lip piercing at all. If you decide to, however, talk to your dentist to discuss the health risks and tips for maintaining your healthy smile. Grinding can wear teeth the edges of your teeth down over time. It also puts additional pressure on your teeth. Unfortunately, grinding teeth often occurs during sleep, which makes it hard to control. However, your dentist in Chevy Chase can make you a fitted mouthguard to wear at night to prevent further damage. If you grind or clench your teeth because of stress or anxiety, make sure you exercise and cut back on caffeine. Visit your dentist twice a year for cleanings and checkups. In the end, wouldn’t you want to address a little bad habit now than to need extensive dental treatment later? Yes, changing your routines can be hard, but switching your bad dental habits to good ones means that you can have a happy, healthy smile for years to come. It’s truly worth the effort. Dr. Ronan Freyne’s dental practice is designed with the modern-day patient in mind. He actively participates in continuing education courses, meetings, and lectures on oral healthcare, and he employs the latest, proven, and most effective techniques to practice state-of-the-art dentistry in Chevy Chase. You can contact him by calling or clicking here.